Residents can reference floodplain data using FEMA's Interactive Mapping Tool called RiskMap6. 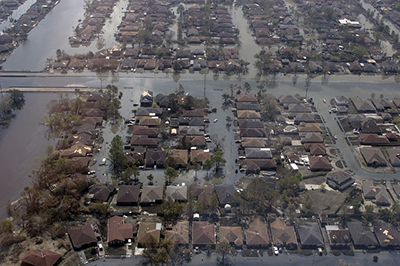 While flooding can occur anywhere, certain areas of Corpus Christi are prone to flooding during extreme weather events. The Federal Emergency Management Association (FEMA) is responsible for preparation of maps that identify areas most at risk for flooding. Shaded Zone X- These properties are in moderate to a low-risk area. The risk is reduced in these areas but not eliminated. Zones AE, A, AH, AR, A99, or AO - These properties have at least a 26 percent chance of flooding over the life of a 30-year mortgage. Zones VE or V - These properties also have at least a 26 percent chance of flooding over the life of a 30-year mortgage. In addition, these properties face hazards associated with coastal storm waves and storm surge. For more information about understanding your flood risk, visit http://www.floodsmart.gov/. A FIRM will generally show a community's base flood elevations, flood zones, and floodplain boundaries. As a property owner/renter, you can use this map to get a reliable indication of what flood zone you're in. The City of Corpus Christi joined the NFIP in 1970 and has underwent several FIRM revisions since. The latest community-wide FIRM revision was in 1992. You can view your current effective zone by visiting either RiskMap6.com or https://msc.fema.gov/ . FEMA is currently in the process of completing the Nueces County Coastal Study, which is the most comprehensive study to date. As a result of this study, FIRMs will be revised to adjust the Base Flood Elevations (BFEs) and Special Flood Hazard Areas (SFHAs) within Nueces County. View preliminary maps for our area at FEMA Maps. Homeowners, renters and business owners in Nueces County are encouraged to look over newly released preliminary flood maps in order to determine their flood risks and make informed decisions. The Texas-based coastal flood mapping effort follows the release of a new, comprehensive storm surge study that gives updated information on coastal flood risks. The FEMA Flood Map Service Center (MSC) is the official public source for flood hazard information produced in support of the National Flood Insurance Program (NFIP). Search your address at https://msc.fema.gov/portal. Send us your questions about zones, maps, development, insurance or other FEMA topics. We will respond as soon as possible.